The last great artist of the Italian Renaissance. 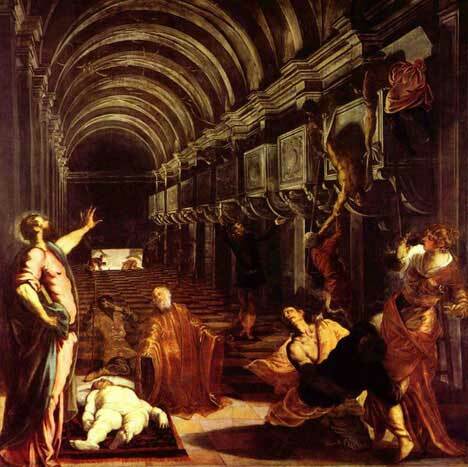 Was Jacopo Tintoretto (real name Jacopo Robusti) a Mannerist painter or the last great artist of the Italian Renaissance? Born on September 29th 1518 Jacopo was one of twenty-one children. His father was a silk dyer by trade and the family was based in Venice. The young Jacopo was trained for a short period by Titian and was a great admirer of Michelangelo, copying his drawings. It is even possible that he met Michelangelo on a visit to Rome in 1545. 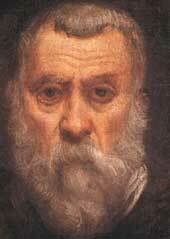 He tried to synthesise the drawings of Michelangelo and the colouring of his old master Titian. 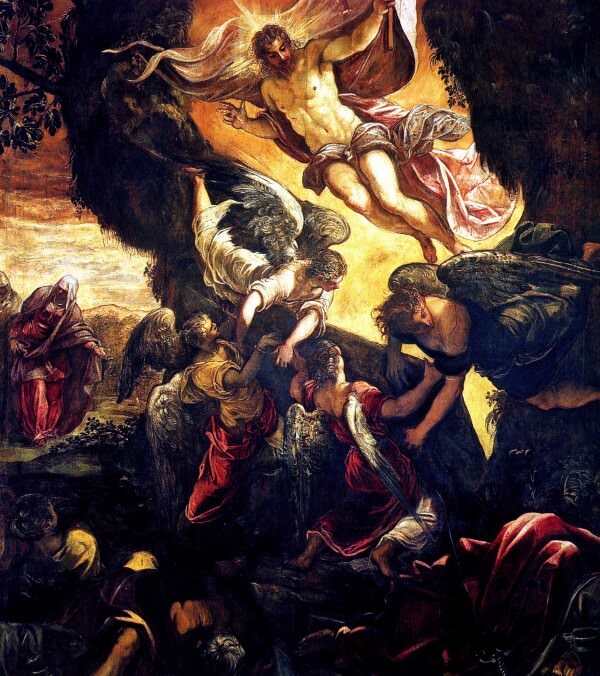 Tintoretto had a style that was all his own and did not seek to paint simply in the 'manner' of the previous generation of artists, so yes, he was the last of the great painters of the Italian Renaissance. 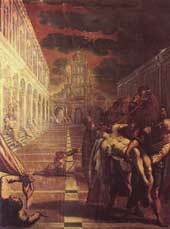 In or around 1548 Tintoretto was commissioned to paint four pictures in the Scuola di S Marco, among these was the celebrated "Miracle of the Slave. 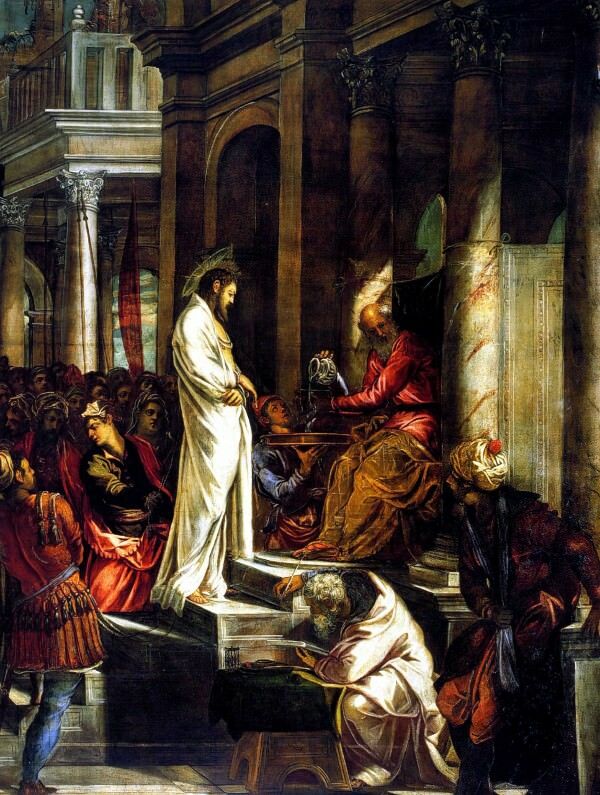 The other works are, "The Finding the body of St Mark", "The Saint's body brought to Venice", and "Votary of the Saint delivered by invoking him from an Unclean Spirit". These works were well received and greatly enhanced the artist's fame. Jacopo married Faustina de Vescovi in 1550 and she appears to have produced two sons and five daughters. Two sons Domenico and Marco, and also his daughter Marietta all assisted him in his studio. In 1564 the artist began his association with the Scuola di San Rocco, where he worked for over twenty years and decorated the building with vast canvases. His theme was the life of the Virgin and the life of Christ. These pictures are executed with tremendous freedom and include an enormous Crucifixion scene. The versatile artist also painted numerous works for the ducal palace but many of these have been lost in the great fire of 1577. The last major work of the artist's life is the huge "Paradise". This painting is a colossal 74 ft by 30 ft, and the artist was assisted by his son Domenico and painted many of the heads and drapery from nature. 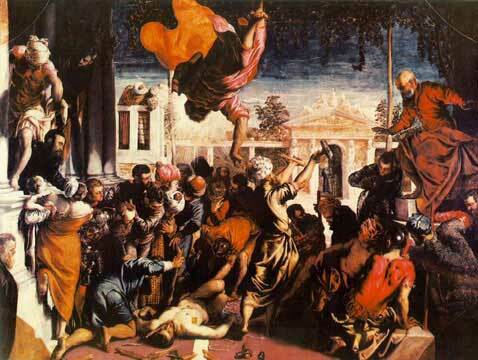 Tintoretto died on May 31st 1594. He had suffered from severe stomach pains and fever and is buried in the church of the Madonna dell'Orto by the side of his daughter Marietta.